Facebook is everywhere. According to statistics if it was a country it would be the 3rd largest country in the world. Everyone who is everyone has a Facebook profile page. It is a way that you communicate with your friends and meet new friends and form networks or communities. It is a tool that politicians and entertainers use to connect with their fans. I even have some friends on Facebook who have pages set up for their pets. Do you ever feel that there seems to be a block between you and your character/s? Or maybe you find that your character does not have enough of a voice in your WIP? If this is the case, I may have a solution for you. In one of my online writing groups, a fellow writer has suggested forming a group for our fictional characters to interact. This led to another member suggesting that each character should have their own name. This has led me to creating a page for my MC in my NaNoWriMo Novel. At first I created a public page for her but realised that she would be speaking through me. She is a very forthright and a strong individual so I have now shown her how to set up her own page. So I have created her own profile. Now at times I may still guide her in this Facebook adventure. She does not come from our time. She comes from 1862 and believes that it is 1862 now. I have allowed her to have her own page to help her in her task. She believes that I am her guide although I hesitate to tell her I have imagined her. Actually now that I think of it, I am not sure that I imagined her at all. You see I would like to get to know her more. She can be quite reticent and stubborn and I am hoping to increase her social network as she does tend to be a bit of a loner. So your Monday lesson is to create a Facebook page for your fictional character or even a blog. You can either create a page and be an administrator on this page. Through here you can switch identities from your actual identity to your fictional character. 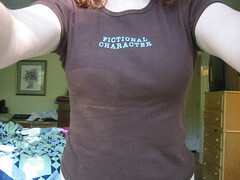 Then choose to set up the “Fictional Character“. This will be one of the choices in the drop down list for categories. Enter a name for your fictional character. After agreeing to Facebook terms, you will have a page set up. You can then suggest this page to any contacts you wish. Add your characters bio and personal info. You will now be the admin for this page. On the right hand side of the page, you will see an option to switch identity. This means that you could post as yourself or virtually through your character’s page. Just like any Facebook page, you can add photos, post statuses or links and start discussions. Another way for you to create a real Facebook presence for your fictional character would be to create a brand new account under a separate email address from your own. The advantages of giving your character their own Facebook account is enormous as a tool to get to know your character. She/He can also then have their own friends on Facebook and maybe meet up with other fictional characters. Enjoy creating an online identity for your character. You never know, you may just find out things about your character by peeking into her virtual world. Enjoy hearing your character speak for her/himself. It may open even more avenues for your WIP. My MC in “Notes from An Alien” is also the co-author. She was involved in the virtual world, Second Life, for about six months before we got down to writing the book. She takes care of the FB and Twitter accounts. whoa…….what an idea! The third largest country in the world is gonna LOVE this idea and so do I. Great !! Can you imagine what is going to happen when the warriors read this? Hello!? New FB groups just for our characters to play in. I’m liking this more and more and more, the more I think about it…. I think you might be onto something here Kim!